You know, while browsing for news and stuff through Google it can be a bit disconcerting when you see what’s to your left. I never knew I had a staff? Where does my staff work? I would really like to meet them because I would like to make sure their picks and interests would reflect me and my name well. It would be nice thought to have a staff to help me publish content on the blog. You know at least an editor to review my stuff. Supposedly I have one but I have yet to meet him or receive comments on anything I have written. Wonder if there’s someone out there pretending to be me… Who ever this Barron character is, he sounds quite fishy and I wouldn’t trust him. *If you’re not laughing or at least chuckling, I have to wonder what is wrong with you. 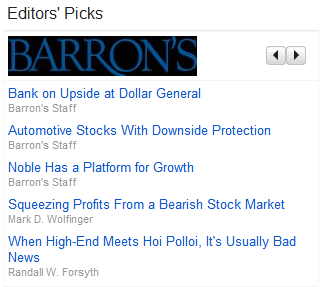 I know about Barron’s business magazine, obviously you need to work on your sense of humor! I would be surprised if you didn’t have a staff!